This is the waterfont on the River Great Ouse seen from the 15th century bridge. The visible spire, 156 feet high, belongs to the Free Church in Market Hill and is dated 1642. The town traces its origins back to a village called Slepe which was a manor of Ramsey Abbey. It eventually became a priory of the abbey dedicated to St. Ivo, a Persian bishop, and has been called St. Ives ever since. 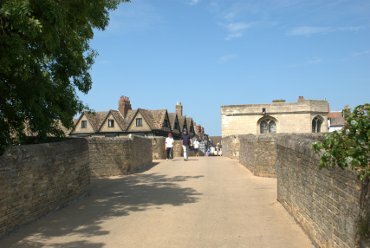 Crossing the old 15th century bridge towards the town centre with the chapel in the centre of the bridge on the right. 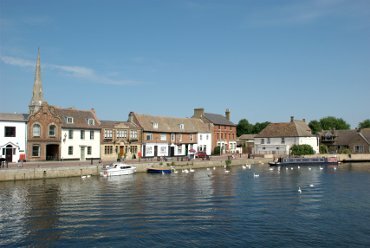 The building on the left with three gables overlooking the River Great Ouse is a manor house dated from around 1600. It is on the corner of Bridge Street which leads to Market Hill. 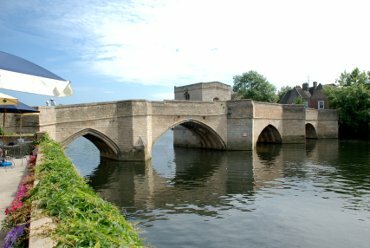 The old 15th century bridge with a chapel, one of only three in England, seen from the terrace of the River Tea Rooms situated in part of the manor house. The bridge is now closed to vehicular traffic and can be used only by pedestrians and cyclists. 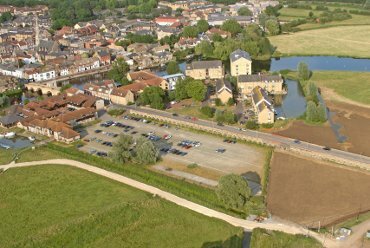 The end of Hemingford Grey Meadow, which we walked across to reach St. Ives, can be seen in the bottom left corner.